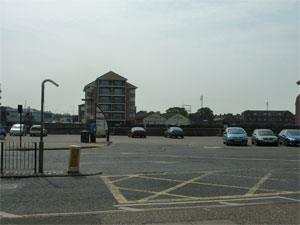 On arrival in Great Yarmouth, looks for signs for the Historic South Quay. If arriving from the Caister-on-Sea go straight over at the Fullers Hill roundabout. If arriving from the A47, go straight over at the Vauxhall roundabout and turn right at the Fullers Hill roundabout. Carry along this road for about 600 yards until you arrive at Hall Plain, Stonecutters Quay car park is on your right next to the river.